I asked one of my runners if she might want to write a guest blog about her Chicago Marathon experience and she graciously said “yes” so here goes! When I signed up for this race in February, I was ready to start training immediately. I bugged Star for months about the best maintenance plan and when I could really start training. I wanted to run this race in 4 hours and 30 minutes, 15 minutes faster than I ran St. Jude in 2012. When we did our time trial, I wasn’t really sure that I had earned the 4:30 goal that Star gave me, or if she gave it to me because it was what I wanted. I did the trial quite a bit slower than the only other person in our group that had the 4:30 goal. I knew I had to work really hard, cross train, and follow Star’s plan to hit that time. Chicago was buzzing with race activity when we arrived! Tons of runners were out doing their pre-race run on Saturday. The Expo was out of this world! The line of runners waiting for someone to tape them up with KT tape snaked in and out of the displays. People were trying on new shoes, new insoles, new fuel, new watches, even new wine! It was so fun! I decided to take it easy the night before the race, so my husband, Geoff and I ordered takeout and watched some football in the hotel. I was asleep by 9:00! Our hotel could not have been any more convenient! I walked across the street, made it through security and was at the front of my corral in less than 5 minutes. I took Star’s advice and signed up for the corral behind the one I should have been in. I stood right on the rope for the start. When I finally started running, my legs felt like ice blocks, they were so heavy and stiff! The race begins on Lakeshore Dr. and we almost immediately ran through a really long tunnel, which was disconcerting. It was dark and PACKED with people and everyone was yelling. When I came out of the tunnel, I looked down and realized I had somehow managed to NOT start my Garmin…..WHAT?! I immediately started the watch and a tiny panic attack. How in the world did I do that?! So now, my pace band was next to useless (later this proved to be false, I’d have REALLY been lost without it). I told myself to calm down, nothing could be done at this point. I had NO idea how far I’d run or how long I’d been running. The best I could guess, I was 4 to 5 minutes off. I do run/walk intervals, but there were so many runners that I had to skip the first walk interval all together. There wasn’t a safe way to slow down enough in such a big crowd. I had to cut the second and third walk interval short for the same reason. I slowed down a little, hoping not to wear myself out. My Garmin kept losing the satellite signal in all the tall buildings so I really didn’t know my pace. I tried to judge it by how I was feeling. At mile three, in the crowd of spectators, I saw a hand raised high above everyone’s head. Immediately, I knew it was my tall husband! I started yelling and waving and he saw me too! There were so many people that it was a miracle to spot each other! The news reported that there were 40,000 runners and 1.7 million spectators along the way! Incredible! About this time, I realized I had possibly over hydrated the night before as I had to go to the bathroom. I thought it could be nerves, so I made a deal with myself that if I still had to go at mile 10, I would stop. This race was SO well run and the route was incredible! I kept asking people cheering us on what neighborhood we were in because there were so many great buildings, cool looking restaurants, and supportive people. I would love to go back someday and just tour each area. I decided at about mile 5 that I would just add 5 minutes to whatever time my watch said and try to determine how I was doing. I looked at my pace band and realized I was almost 12 minutes behind schedule! I ate a honey stinger gel and sped up. I worried with every run interval that I was going too fast and would crash at the end, but I was feeling really good, so I pushed on. During the 9th mile, I really really had to go to the bathroom. I saw a sign that the toilets were 500 meters ahead and, wouldn’t you know it, I hit a walk interval just as I saw them! There was a line for the first three, so I ran down the row of port-a-potties and there were plenty available. I never missed a second of my run interval and felt SO much better. I saw Geoff again at mile 12 and I knew he had made friends with a group of people around him because they were all cheering LOUDLY for me! So fun! At the half marathon mark, I decided to put my headphones in to try to get a rhythm and speed up. Most of the time, I could hardly hear my music because the crowd was so loud and there were so many watch parties with music playing. At mile 15, my watch said almost exactly what my pace band said it should have, so I knew I had made up quite a bit of time, but I was still 4 or 5 minutes behind. I was still feeling really good so I kept pushing. The weather was amazing, sunny with a calm breeze. I couldn’t have asked for a better day. I saw Geoff again at mile 16 and was close enough to him that I could stop and grab a quick kiss for good luck. I was so impressed with how he got around the town! He learned the train system and just hopped around the whole city. Best cheerleader ever! I should have asked him how my time was, but there just wasn’t time. This race had a really wonderful runner tracking system. At each 5K point, there was a timing strip and when I crossed, it updated an app Geoff had on his phone. Pretty cool! I was running along with several people from Team Mexico and was happy to be near them when we ran through a Hispanic neighborhood- they sure know how to cheer! I just pretended I had on a Tabasco shirt also and that they were cheering for me! They were passing out orange slices and cups of ice to any runner that needed them. It was incredible! At mile 19, according to my pace band, I had made up two more minutes. My brain was exhausted from trying to calculate my time, but the best I could tell, I was two or three minutes off to reach my goal. We made our way through China town and that was incredible! The support was overwhelming. I did see a man try to cross from one side of the street to the other and just get plowed down. I don’t know why anyone would try to cross the race course! By mile 21, I had a really bad side stitch and I couldn’t shake it for some reason. I was working on my breathing, but couldn’t get it to go away. At mile 23, the side stitch was really bugging me. I saw Geoff and yelled to get his attention. When he spotted me he started screaming, “You’ve got to finish strong! STRONG!! !” I immediately knew he knew something I didn’t about my time. I really needed to fuel, but I was feeling sick and my side was killing me. I came up to a water stop and got a cup of Gatorade. I took two drinks and remembered why I can’t drink that stuff! Gross! I washed it down it some water and walked for ten more seconds trying to get the side stitch to go away. I started running and told myself that this was it, I had less than a 5K to go and I knew I could do it. I decided not to take anymore walk breaks and to ignore all the girls puking all around me. I’m sure it was really only 2 or 3, but it seemed like everyone was throwing up. At mile 25, I felt like I was flying and dying at the same time. I made a new rule that no one could pass me before the end. By this point, the crowd was incredible! I’ve never seen so many people cheering on a race- and I knew most of them had probably been there for 6 hours! It was amazing! Geoff and I had planned to meet in front of the hotel. I had to walk about three blocks to get there and when I did, there was a fence between me and the hotel! I asked a police officer if I could sneak out of the fence because my husband was right on the other side. He nicely told me, “no.” I started crying then, my legs hurt so bad I thought I would die. I finally sat down on the sidewalk (along with a lot of other runners) and sipped a protein drink they had given me. At this point, I still didn’t know if I’d made my goal or not. I finally got the energy to get up and keep walking. I had to walk two more blocks to get out of the park, then walk back two blocks to where Geoff was waiting. He handed me a beautiful flower and didn’t complain that he had waited for an hour for me to get there! Poor guy. The first thing I said was, “What was my time? !” He told me it was 4:29:35, I’d beat my goal by 25 seconds! We got back to the room and my phone was blowing up. Being able to run that race was amazing, but the support that I got from my husband, my coach, my team and my family and friends was beyond compare. To realize that so many people were cheering me on, tracking me, and rooting for me leaves me speechless and so grateful. What an amazing training season, awesome team, and fun race. For anyone interested in my 2 cents, Emily ran a very strategic race, whether she realized it at the time or not 😉 At the half marathon marker, she was at 2:18:18 and her pace band called for a 2:14:14. So, with 4 minutes to make up over 13.1 miles, I wasn’t too nervous because I knew she started smart and even if she didn’t realize she was behind, she was going to be able to make it up. 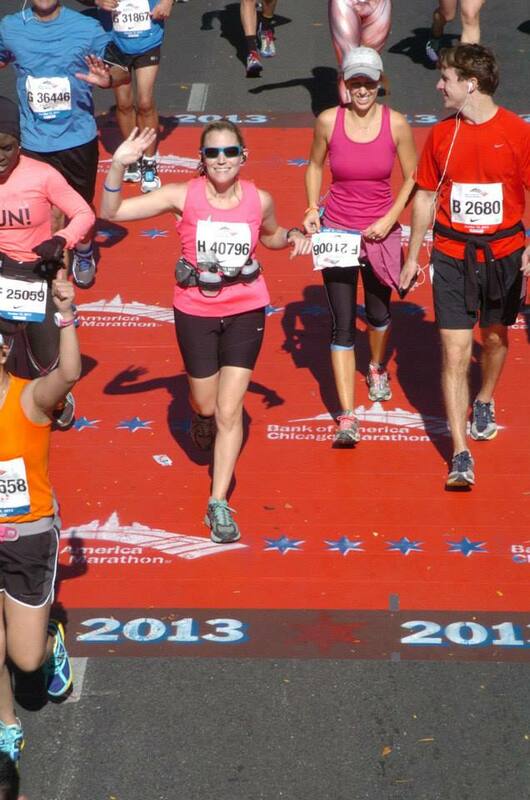 The key was going to be for her to realize that she had 13.1 miles to do this…and not try to do it in 3 or 4 miles. The kiss of death in a race is to start out too fast so the fact that she had gotten a little behind worked in her favor rather than had she gotten ahead. My rule in the marathon is to reassess any time after mile 18 and to make strategic changes after this point if necessary..whether it is to slow down or speed up. This is exactly what she did at mile 24 when she decided to abandon her last few walk breaks. Because she started conservatively, followed her pace band (as well as she could with her watch mix-up), and ran with heart at the end, she mastered this race. It was so exciting to keep up with and watch the projected finish time get closer and closer to our goal and then to see Emily run her fastest mile from 25 to 26…that was just awesome! We’re super proud! Oh, and just to clarify, Emily actually goal-tested for a 4:31:30 but I rounded down 😉 Although I think it’s sweet that Emily thought I had given her a goal based on “want” rather than “ability”, that will never happen!